"To every complex problem there is a simple solution, startling in its simplicity, piercing in its clarity, and hopelessly and completely wrong" - Gore Vidal. At the latest liaison meeting with Vital Energi we learned that the pipe-laying operation is slightly behind schedule but with no serious problems. Most of the delays are due to congested services and other underground problems that couldn’t be detected before the digging started. The contractors have also done some repair work to the surface water drains in Lime Walk which were blocked or broken. Here is the latest schedule, which is always kept up to date on the Hospital website. We also heard details of how the London Road work will be managed. Traffic lights will be set west of Sandfield Road and east of Latimer Road. Two of the three lanes will be closed, with all traffic confined to the remainng single lane. The Latimer side will be closed first with all traffic using the eastbound bus lane; then the system will be switched so traffic runs on the westbound lane. 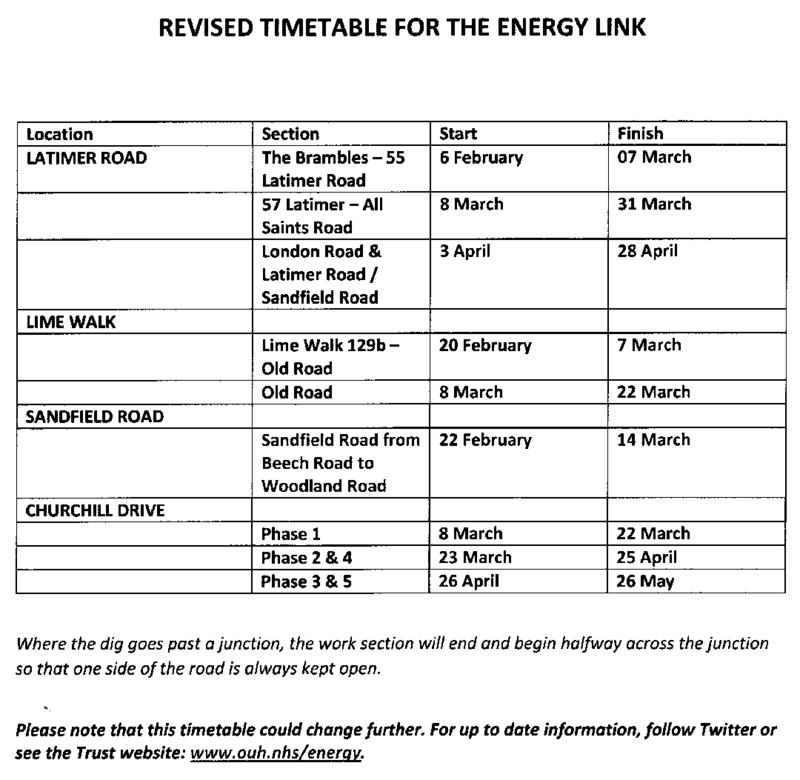 Both Latimer and Sandfield Roads will be closed at their junctions with the London Road for the duration of this work, with diversions set up for traffic needing access.